The experimental Aerotrain was built by General Motors using hard riding Bus Bodies for coaches, a new untested (and quite complicated) air cushion suspension system, and an under-powered motor originally made for switching locomotives. Two of these trains were built in the 1950's as a way to entice passengers back onto the railroads and out of their automobiles. The hard-coupled unit had one engine and 10 cars attached, including the observation car. These low-slung units toured the United States as a test of it's abilities. Needless to say, it was a tremendous failure. It toured on four roads including the Atchison Topeka & Santa Fe, New York Central, Pennsylvania Railroad, & Union Pacific before eventually being sold to the Rock Island for Chicago Commuter Service. In 1966, after less than a decade of service, one locomotive & two cars were sold to the National Railroad Museum in Green Bay, Wisconsin, while the other locomotive and two cars were sold to The Museum of Transportation in St. Louis, Missouri. 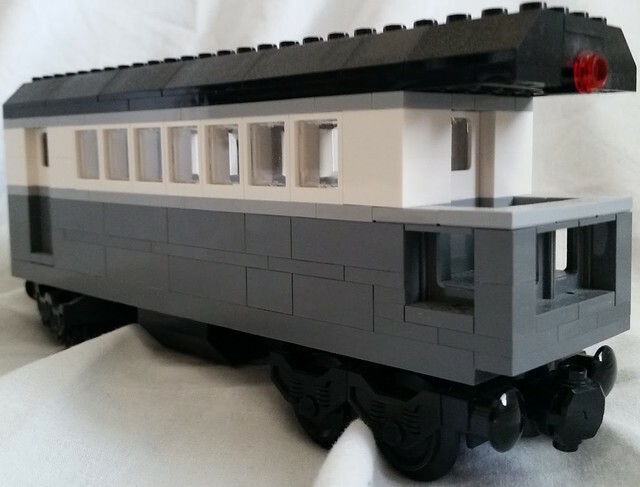 The original train had ten cars, which would be hard to do in Lego (and it's kinda pointless as 9 of then are identical) I have five cars on my train, four identical coaches and one observation coach on the end. 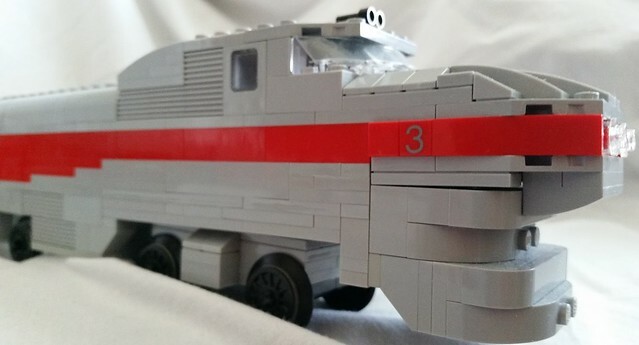 My Inspiration for this model came from three pictures from this Brickshelf account here: http://www.brickshel...ry.cgi?f=497396 and I give 99% of the credit for the model to Brickshelf user enquete-art. The other 1% comes from me, such as the reworked wheels, front and back windshields, window SNOT work and red number tile. The train can no longer separate into sections, as the magnets on the loco kept separating from the train. I replaced them all with draw bars made from Technic lift-arms, which is more like the real thing anyway. Also, the model takes curves reasonably well, so my fears of it not working were unfounded. This is the tail end of the train. 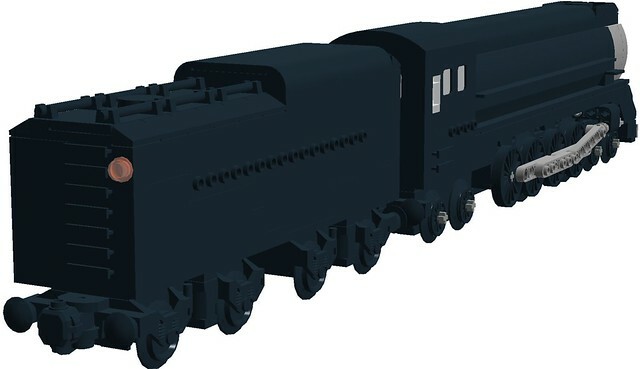 This engine was inspired by Anthony Savas 2-6-4 Pacific, but uses design cues from his 2-8-4 Berkshire, the Emerald Night, the pistons from Zephyr1934's lone Ranger engine MOD and the original tender frame from the first incarnation of the 4460 from 2013. As you can see it has now been built in real life. EDIT: Aas of 1/22/16, my 8 wide Southern Pacific Daylight loco has been remade into a 6 wide model. 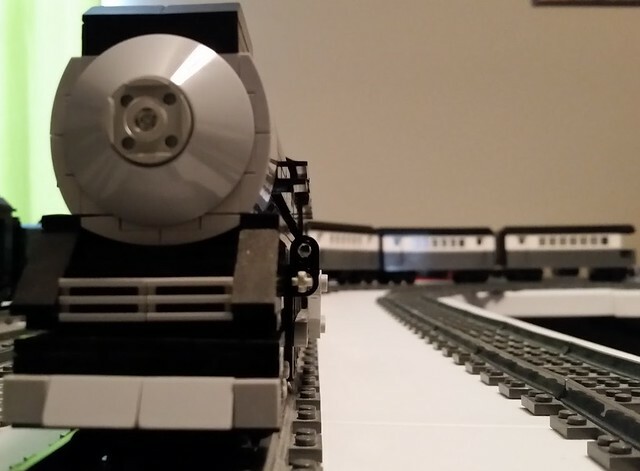 I used the same ingenious idea for the smoke-box as Eurobricks user Electricsteam did for his Pneumatic locomotive, but with my own styling with curved parts instead of the more straight-edged cheese slopes. Here is the loco from the side, where you can see the printed parts saying "4460" & "SOUTHERN PACIFIC". Aslo while the loco stayed the same length, the tender has been shortened significantly to better fit in with the rest of my 6 - wide steam fleet. I based these coaches off of two sources: the Wabash Frisco & Pacific Railroad (a 12 inch gauge ride-on steam line in Glencoe Missouri, near St. Louis) and the coaches formerly owned by the Museum of Transportation (also in St. Louis) before they were sold in 2012. The Southern Pacific 4460 never pulled these cars in real life, as the engine has never been restored to working order. The name of the train is based on the location of the Wabash Frisco & Pacific Railroad, which sits right next to the Meramec river on the old (1850's - 1940's) Missouri Pacific railroad track-bed. Combination baggage and passenger car, also known as a combine. The observation coach of the Meramec River Runner. I want to say thanks to everyone who followed and encouraged me on this almost-three year journey from February 17, 2013 (the original posting date of the first version of the Aerottrain, and about six months before the Daylight's first version) to December 27, 2015. It's been quite a trip, and I've made plenty of progress on building my skills and tons of friends along the way.... and no, it's not over yet! Those are two well done pieces. The Aerotrain, for the sheer fact that it's a rare type and getting the crazy lines done right must have been hard. The 'Forgotten Daylight' is cool because I'm a big steam fan and large steam engines are a beast to build. Congrats on the hard work. Thank you! The Daylight also has some passenger coaches to pull around my layout.... I wasn't sure about adding them to the first post, because the are not based on any coaches the actual engine has pulled, (or ever will, as the engine is not restored) but do look nice behind it. 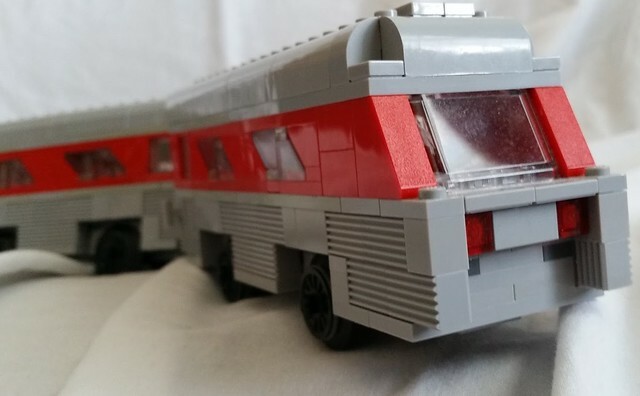 Nice to see I'm not the only LEGO and train fan here on Eurobricks from the St. Louis/Missouri area! Anyways, really great MOCs. They look so simple, but yet they're still a beauty. Great job! agree,They look so simple, but yet they're still a beauty. Great job! Anyway, I'll get off my soapbox now. Thanks again for commenting! That's what my old "bag of ideas" topic from a few years ago was kinda suppose to do. Find old pictures of "last of it's kind" style trains and experiments. I love the "Forgotten Daylight"! As I am really into North American Steam, it's beautiful!! Thanks! I am currently debating making the Daylight 6 wide so it fits in better with the rest of my steam fleet. I've already roughed out the design changes via LDD. I just ordered the parts to re-make my 8 wide Southern Pacific Daylight loco into a 6 wide model. 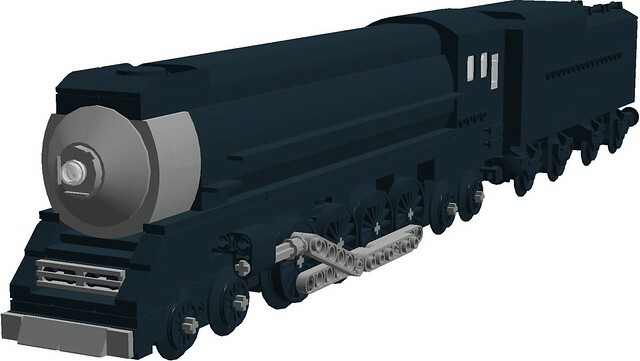 I used the same ingenious idea for the smoke-box as Eurobricks user Electricsteam did for his Pneumatic locomotive, but with my own styling with curved parts instead of the more straight-edged cheese slopes. I managed to keep most of the details and even added a crew walkway from the front of the loco to the cab. While the loco stayed the same length, the tender has been shortened significantly to better fit in with the rest of my 6 - wide steam fleet. 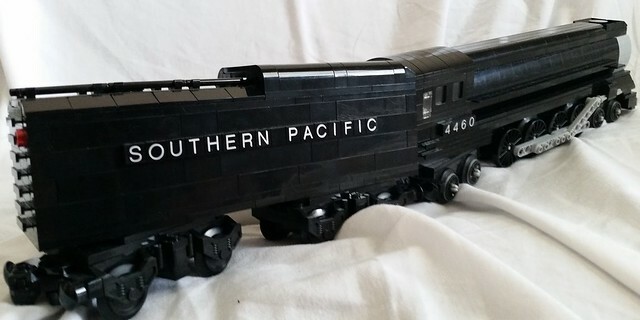 It still is supposed to say "SOUTHERN PACIFIC" on it where the studs on the tender are. The number "4460" goes on the cab. UPDATE: Sorry for the bump, but the first post has been updated to have my updated 6-wide 4460 model. Here is the loco with the The Meramec River Runner passenger train. Thank you! I just added some more trains to the first post so feel free to tell me what you think of them!